Priced below County assessment! Tremendous opportunity!Young farmers, or anyone, any age, seeking to make a new life in the country, take note of this very special property. You can own your own 32 acre farm with approximately 20 acres of producing fruit trees, a large stocked pond, a restorable barn, and a comfortable 3 bedroom, two bath home at a price that is incredibly affordable. Do not pass up the chance to own this gem. With beautiful mountain views, this unique property offers peace and quiet, yet it is neither remote nor difficult to access. Less than fifteen minutes from Front Royal, High Places Orchard enjoys the privacy and serenity of rural living in desirable Rappahannock County with all the amenities of the larger community in nearby Warren County. 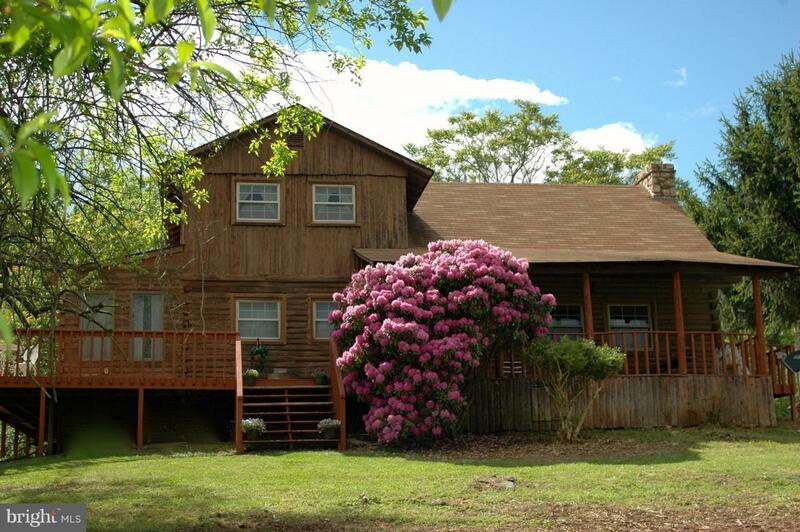 The log home on the property, built in 1979, its perfectly located in the center of the farm to take advantage of its bucolic setting, with mountains in the distance and acres of orchard in the foreground. It perches on the gently sloped land fanned out below it. The home is well built and inviting, with a beamed cathedral ceiling and enchanting stone hearth and fireplace in the living room, a first floor master bedroom and bath, two bedrooms and a bath upstairs, a large sun room addition, and a wrap around deck. An office and laundry room/pantry are conveniently located on the first floor near the kitchen. The home is approximately 1930 square feet (Note: There is more square footage than is reported on some national websites!) The orchard, lovingly planted and cared for by the current owners~ parents, offers hundreds of apple trees, of numerous varieties, as well as many peach trees, pear trees, and cherry trees. The trees are of various ages, with some having been planted on the 1980~s and some as recently as this decade. Although they have not been pruned or sprayed since 2016, they are still producing large quantities of fruit and some sweat equity can return the orchard to full production capacity if desired. The recent lack of spraying would help qualify the farm as organic in a few years. A little local history about the area is quite interesting. What is now Winesap Lane was once a public road known as Fiery Run Road that crossed the Rappahannock River and continued into adjoining Fauquier County. Now it starts at Little Long Mountain Road (formerly Poe~s Road) and passes through part of a small, historic community called ~Shootztown~ or ~Schultztown.~ There is fascinating history about this part of the county available in the records of the Rappahannock Historical Society.Arguably one of the most compelling features of High Places Orchard is that it is located in Rappahannock County. A rural oasis that values and promotes agriculture, seeks to preserve its scenic beauty and country life-style, Rappahannock County is located only about 70 miles from Washington D.C. In just 274 square miles, approximately 7000 people live in the small communities and villages, connected by scenic, curving roadways that pass through undulating green hills dotted with fields and forests. With almost a third of the county located within the Shenandoah National Park, the stunning western mountain vistas are guaranteed to remain unspoiled. Careful zoning has discouraged the rampant development that has overtaken other counties. Small country stores support each of the villages, while the adjoining counties of Warren, Fauquier, Culpeper, and Page provide large grocery stores and shopping opportunities available within a half hour~s drive.Rappahannock County is home to a number of small shops, art galleries, a community movie theatre, a performing arts theatre, several wineries, a few breweries and several restaurants, including the world famous Inn at Little Washington. There are numerous community organizations and activities offering the opportunity to meet and enjoy your neighbors, making life both fulfilling and interesting!